Well this is a great find! 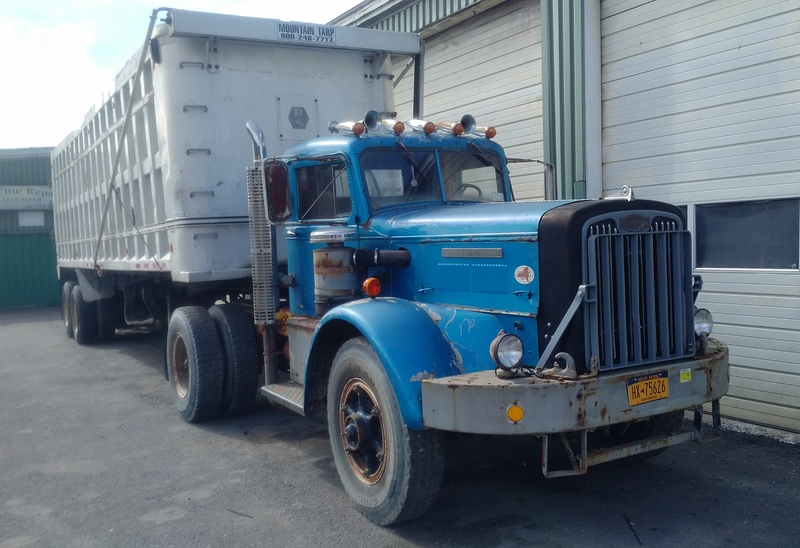 A 1953 DC single axle still plated and working in Binghamton, NY. Brian spotted this truck at Ken Fines truck repair. It’s hard to say if the rig is in for repairs or pulling duty as a yard jockey. What an amazing find Brian! Thanks for sharing. Do you have an Autocar truck you would like to see featured in Autocar Mondays? Email eric@dailydieseldose.com today! That cab says this may be an earlier Autocar than 53, this is quoted from info found in Robert Gabrick’s Autocar Book 1950 -1987 Photo Archive, “In 1950, the Autocar introduced the cab it was to use until 1987. The all-steel Autocar Driver Cab replaced a cab constructed of wood and steel. The welded frame consisted of heavy-gauge steel channel sections. All sheet metal, including the one-piece roof panel, was welded to this frame. The large windshield featured curved sides, but maintained a two-section design to reduce replacement cost.” I believe this may be an earlier Autocar, perhaps 48-49. If it’s a 53 like the post suggests, it’s had an earlier cab replacement. —- Just off the phone to Ken Fines in Binghamton — sending me some more pics and verified the truck is a 49. Actually the cab introduced in 1950 was used till about 1966, then the cab with the higher windshields was used till 1987. The cab on this truck is surely not a 1953 as Mr. Murphey already posted. Excellent find all the same. Spoke with the owner of this truck, Ken Fine Truck Repair in Binghamton (an hours drive from me) he states this Autocar is a 1949 DC 75. Good detective work George. As it turns out this truck was once part of the Dave George fleet.